On a grassy knoll inside Central Park at the People’s Climate March, a group of demonstrators, keen on enlightening the world, had set up in plain view (see my original report) and readied themselves for their spectacle. Some eight or dozen people, half men, half women, all roughly thirty years old, were doing jumping jacks. Hup two three ourp! A smaller group was demonstrating squat thrusts—down! up! down! up!—while a third bunch were showing arm curls with tree branches evidently foraged from the park. Unh unh unh! This athletic show was meant to convince people to be one with Mother Earth, to be one with the Universe, to be one with each other. Or something like that. No, wait. It wasn’t weight lifting or old-fashioned calisthenics. I mis-remembered. It was yoga. Well, they’re easy to mix up, right? Each are forms of exercise, conduits for health and that kind of thing. Isn’t that so? We’re seeing a lot of this lately. People cropping up, flexing their musculature in an effort to twist the space-time continuum to align the vibrations (it’s always vibrations), to be in spiritual resonance, and to cause bystanders to fall under the spell of these vibrations and travel along the same world-line to the final destination of Full Enlightenment. A women in the video said, “I felt Peace. I felt Peace. I mean, I’m like I’m not sleeping and you know there’s this craziness and you feel you’re really upset but I was at peace today. It was nice.” Another man (pictured above), looking like the Director in some California corp “Oohhmmed” silently and said nothing. …To the northwest, brightly colored characters dressed like monochrome dervishes twirled in silence. To the northeast, a row of five figures wearing black from head to toe engaged in slow-motion yoga. It was a typical scene this week in Cleveland’s Public Square, the 10-acre park where demonstrators, media, and above all police congregated while delegates duked it out at the Republican National Convention. Yoga mats as physical as well as spiritual weapons! 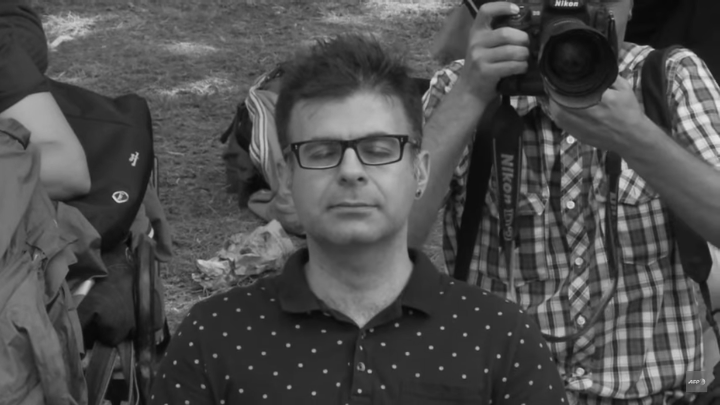 Item The Yoga of Protest Politics: How to Bring Yogic Principles into the Upcoming Election Season by white guy Josh Schrei. How do we reconcile the yogic teachings on inner calm with the anxiety we feel at the state of the world? How do we quiet our mind when… Trump? [ellipsis original] And should we quiet it at all? Isn’t our outrage at the current situation a catalyst for change? Shouldn’t we be out in the streets and in the back alleys of the Twitterverse calling for a better world? Or would that be decidedly “un-yogic” of us? There are so many more such items that they represent a trend. Not only in the public display of provocative or hideous clothing (as the body of the wearer is fit or not) known as “yoga pants”, or in the danger of sliding under the sway of bizarre religious figures (such as with Dahn), but in the return to something like an old-fashioned kind of paganism. These protesters really do think, like those doing jumping jacks or stretching before the game really don’t think, that their pretzel-bending is manipulating “elements” and that these manipulations will cause spiritual changes in others. But unlike paganism in the good old days, the only gods yoga-ists recognize, besides the universe itself or Mother Earth, is themselves. Interesting, no? Currently, I’m eating a Cornish pasty for World peace. Also drinking espresso for greater harmony. And the World is a better place. For me anyway. “these manipulations will cause spiritual changes in others”—isn’t that the Democrat Party’s platform? Yogic granfalloons. Vonnegut would be pleased. Yoga started about 100 years ago as a combination of Indian fakir carnival acts & British army calisthenics. Apparently Power Yoga was used in the olden days to train young Indian warriors hence some of the poses are called the Warrior poses. Think people holding clubs for Warrior one, and people drawing bows for Warrior 2. It’s good for people with short muscles too. No need to believe in the mumbo-jumbo, if you don’t want to. It is just gymnastics. Just saw your sidebar with the Trump tweet. That should put the final nail in his political chances coffin. Imagine voting for a politician who once admitted to not believing in faerie tales. In one stroke you’ve managed to drive away any potential Trump supporters in the Hillary and Bernie camps and maybe his Build-a-Wall supporters, too. On the bright side, maybe they’ll jump on the ” Vote for Hemp” wagon. “H”J could use the help. Previous Previous post: Uncertainty (#1 New Release in Statistics) Book Page — Here Are The Details. Update! Next Next post: Computers Can Find Future Criminals? Why, Computers Can Do Anything!